The Camp Cadet program is free to Cadets and their families. The Cadets are able to participate without cost in this worthwhile program because of the tremendous support from businesses and the general community. The Camp Cadet program is entirely funded through these generous contributors and their donations. The cost for 1 week for each Cadet is $250. 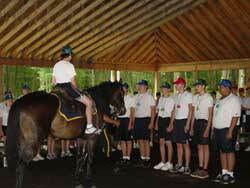 Each Cadet class can accommodate a size of 80 candidates. Donations and contributions make this wonderful experience possible. For more information, please email Trooper Thomas Kelly, Camp Director, PA State Police - Troop P, Wyoming.